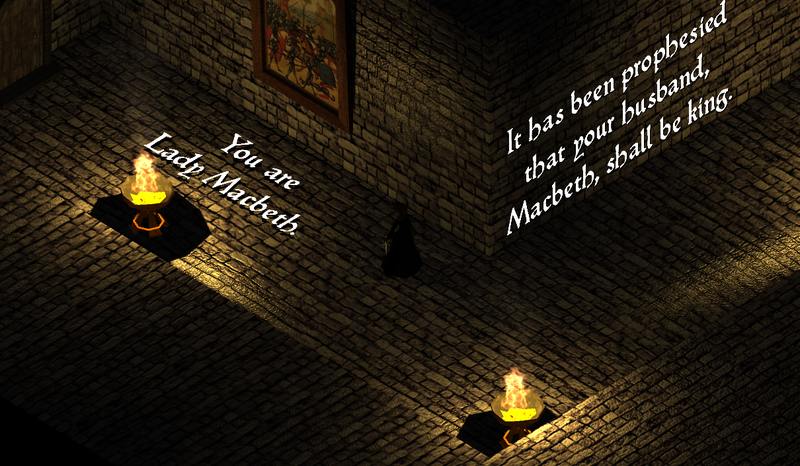 An action-stealth game based on Shakespeare's "Macbeth"
Release code as public domain? Very impressive. Did get one hang when washing my hands but otherwise I was sold on the spooky atmosphere of the castle which matches the plot perfectly. Great entry. I've been hoping someone would take on some Shakespeare for this jam, and you certainly did the bard's tale justice. Great animation, art coupled with the sound and music really capture the dark mood of the murderous plot. Best of all is the game design, especially the blood/ghost mechanic; most innovative use of source I've seen so far. Hope you participate next time around too, looking forward to more ideas like this...Maybe somebody needs to do a Shakespeare gamejam? 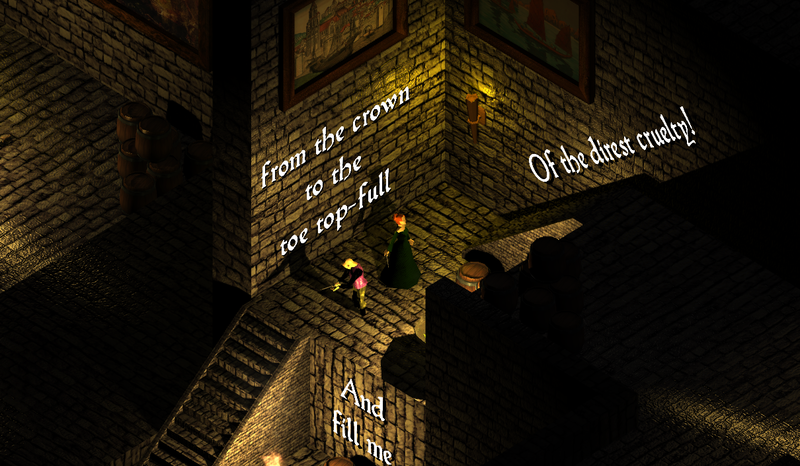 Maybe, I'm just not used to this type of game and the controls, but the thing I most found difficult was climbing the stairs. I played a mostly pacifist run and didn't use the water one in the proper level, but, assuming killing the king is the end, I think you ought to make that clearer. I'd still be playing if I hadn't got stuck on the bridge. This is one of the source materials I do recognise and I think it was very well played with. This is an amazing entry. Great graphics and interesting gameplay - challenging yet balanced. Nice level design as well, with a good difficulty curve. A great spin on the source material, as well. Also congratulations for the female protagonist. Oh, and I really liked the various death animations. 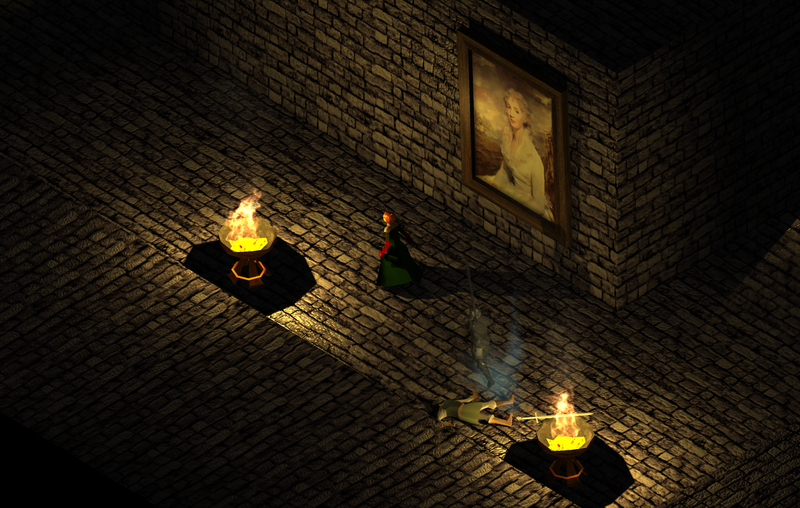 My only criticism was that sometimes the isometric angle, darkness and wall/floor textures meant I got very confused at certain points where the floor ended and the wall began. Oh, and I found it odd that the guards kill both of you on sight. At least Macbeth should get clearance, as the best warrior in the land! Maybe Macbeth could go up and distract guards, while you kill from behind? This is a game with simple mechanics, but great execution. The stealth mechanics are refined, and the graphics are great. Love the addition of Macbeth passages later, though Macbeth himself kinda drags be down- but that's what you were going for, right? Some bugs: if I was on the left of a guard and the Kill option came up, that guard would jump in front of me before I swung my dagger. In the 2nd room, those pillars would become cubes, and would tower as I came up to them. I'd have liked to see my water before some levels, so I could see how much I had to work with. The "big room" of the 2nd door was one of these; I found only 1 place to wash hands, but it was at the other end of the room; I didn't know how much I had to work with. This is a great entry to the jam. Excellent work! This is my favourite of the ones I've tried thus far. Female protag (the fact that she is a murderess is incidental :P). Mechanics are polished and well executed, the level design is good and the difficulty ramps well. Story unfolds well, and it all integrates into the source material fantastically. I'd love to see this expanded into a larger project. I did have some technical issues - I had the game freeze up twice during hand washes, and having the checkpoints work automatically was good but also restrictive, as I missed some of the early game and wanted to replay it without the option (the game did randomly reset completely upon death in the second section once though). If you were able to iron this out, it'd be a perfect little experience. Really impressive entry! The washing of your hands is a very cool mechanic and the stealth is executed well.